Fire Insurance May Not Pay for Certain Kinds of Damage | The Voss Law Firm, P.C. A typical fire insurance policy may pay to replace or repair anything on the property that is damaged by flames or heat sources. 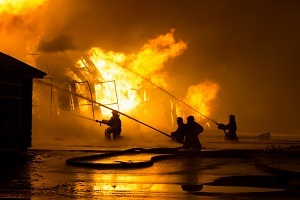 However, there are many types of commercial fire damage coverage, and each will have exceptions and exclusions that result in lower claim payouts. Attorney Bill Voss explores different fire insurance options and how each one can dramatically change the cost of the claim. The language used in your policy plays a big part in how much you will receive after a fire. For example, many items that were not touched by flames must be discarded due to smoke damage. Odors in draperies and furniture, melting plastic and chemical residue, and poor air quality may all be directly related to a fire, but could be excluded from coverage if they did not actually make contact with the blaze. Soot and stains. Soot and ash can discolor the walls, floors, and ceilings, and will need to be vacuumed out of the walls in order to prevent future overheating and ill health effects. If these items can still perform their basic functions, the insurer may not consider them damaged, and may deny payment for their repair. Appearance and matching. If a fire is confined to one area, the owner will likely wish to restore the damaged area in a way that matches the rest of the room. If the fire has ruined the wallpaper on half of the room and the exact wallpaper cannot be found, insurance should pay for new wallpaper to redo the entire room to give the room a uniform appearance. Building upgrades. One of the best endorsements for any commercial fire policy is law and ordinance coverage, also known as upgrade coverage. If an owner is forced to repair a ruined structure, he or she will be required to comply with current building codes—a cost that is typically not covered by insurance. If the building is decades old, the cost of updating the property can add thousands to the restoration cost.